The ancient scarab beetle amazed the Egyptians of the time, with Its beautiful, color-shifting exoskeleton — which mirrors light in tones of purple, blue, red, and copper — appeared magical and beyond the powers of mere man. Thus the scarab became a staple in Egyptian art and religion, as a symbol of the restoration of life and was used for amulets, talismans, and jewelry. 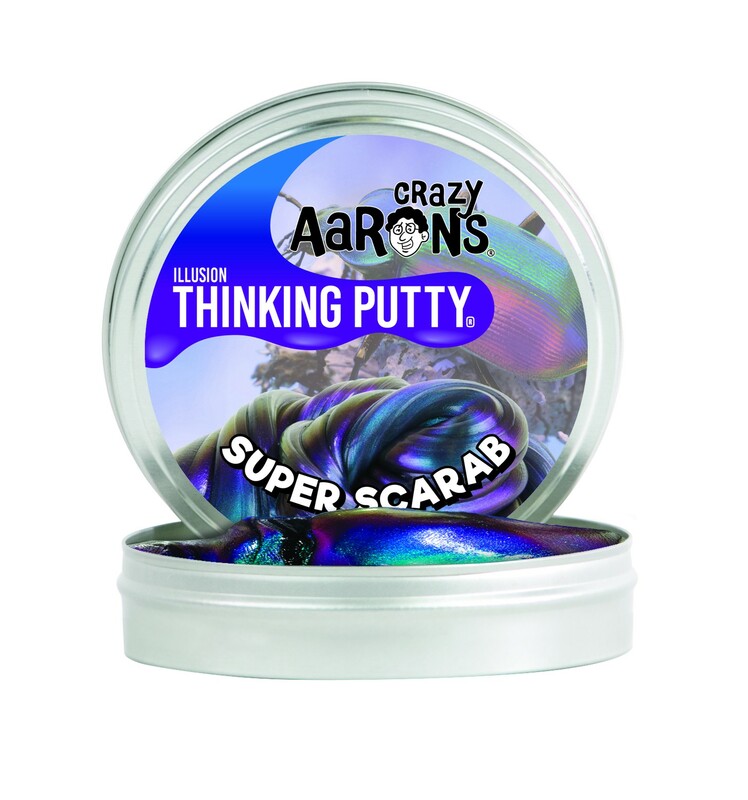 Super Scarab Thinking Putty is a modern interpretation of this colorful icon that's sure to leave you as spellbound as its namesake. In 1998, Crazy Aaron set out on a quest to create a newer, more creative version of the putty that he loved in his youth. Becoming self-taught in chemistry, physics and after a whole lot of experimenting, the first batch of Thinking Putty was born! Quickly he realized that this product was so unique and the creation process so sensitive, it was going to take a special factory to make it! That’s just what he did. Today, Crazy Aarons works with seven Philadelphia-area vocational centers to employ many exceptional individuals with intellectual and physical disabilities. That's in addition to two corporate offices where Thinking Putty is proudly made in the USA. Starting from a small company with a handful of employees, Crazy Aaron's Thinking Putty has grown into a top brand in specialty toys. Available in an amazing array of over 40 colors, Thinking Putty is a fun and unique product that's proudly made in the USA, and has won several significant awards in the industry. Grab a hold of a tin, and see where Thinking Putty will take you!